For other uses of "Hookah", see Hookah (disambiguation). 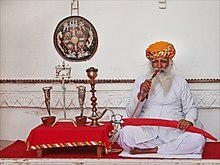 An Indian man smoking hookah, Rajasthan, India. A hookah (from Hindustani: हुक़्क़ा (Devanagari), حقّہ (Nastaleeq), IPA: [ˈɦʊqqaː]; also see other names), also known as the ḡalyān (Persian: قلیان), is a single- or multi-stemmed instrument for vaporizing and smoking flavored tobacco (often Mu‘assel), or sometimes cannabis or opium, whose vapor or smoke is passed through a water basin—often glass-based—before inhalation. Health risks of smoking through a hookah include exposure to toxic chemicals that are not filtered out by the water and risk of infectious disease when hookahs are shared. There are two theories regarding the origin of the hookah. The first is that following the introduction of tobacco to medieval India by the Jesuits, the waterpipe was invented by one of Akbar's physicians, Abu’l-Fath Gilani, an Iranian from Gilan, in the Indian city of Fatehpur Sikri during Mughal India; the hookah spread from the Indian subcontinent to the Near East, where the mechanism was modified. Alternatively, it could originate in the Safavid dynasty of Persia, from where it eventually spread to the east into the Indian subcontinent during that time. The word hookah is a derivative of "huqqa", a Hindustani term. Outside its native region, hookah smoking has gained popularity throughout the world, especially among younger people, largely due to immigrants from the Levant, where it is especially popular. Mughal emperor Jahangir's jade hookah, National Museum, New Delhi, India. Karim Khan of Persia seated in his royal court in Shiraz, using a Qaelyan (1755). The most highly-dressed and splendid hookah was prepared for me. I tried it, but did not like it. As after several trials I still found it disagreeable, I with much gravity requested to know whether it was indispensably necessary that I should become a smoker, which was answered with equal gravity, "Undoubtedly it is, for you might as well be out of the world as out of the fashion. Here everybody uses a hookah, and it is impossible to get on without ...[I] have frequently heard men declare they would much rather be deprived of their dinner than their hookah." Argilah or Argileh (Arabic: أرجيلة‎, sometimes pronounced Argilee) is the name most commonly used in Lebanon, Syria, Palestine, Jordan, Azerbaijan, Uzbekistan, Kuwait and Iraq, while Nargilah (Hebrew: נַרְגִּילָה) is the name most commonly used in Israel. 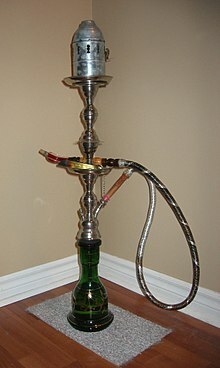 It derives from nārghile (Persian: نارگیل‎), which in turn comes from the Sanskrit word nārikela (नारिकेल), meaning coconut, suggesting that early hookahs were hewn from coconut shells. In Persian, it is known as qalyān (قلیان). In Croatia, Serbia, Bosnia and Herzegovina, North Macedonia, Greece, Turkey and Bulgaria, na[r]gile (на[р]гиле) is used to refer to the pipe, while šiša (шиша) refers to the tobacco that is smoked in it. The pipes there often have one or two mouth pieces. The flavored tobacco, created by marinating cuts of tobacco in a multitude of flavored molasses, is placed above the water and covered by pierced foil with hot coals placed on top, and the smoke is drawn through cold water to cool and filter it. In Albania, the hookah is called "lula" or "lulava". In Romania, it is called narghilea. "Narguile" is the common word in Spain used to refer to the pipe, although "cachimba" is also used, along with "shisha" by Moroccan immigrants in Spain. The word "Narguile" is also the word used in Brazilian Portuguese. Shisha or sheesha (شيشة), from the Persian word shīshe (شیشه), meaning glass, is the common term for the hookah in Egypt, Sudan and countries of the Arab Peninsula (including Kuwait, Bahrain, Qatar, Oman, UAE, Yemen and Saudi Arabia), and in Algeria, Morocco, Tunisia and Somalia. In Yemen, the term mada'a (مداعة) is also used, but for pipes using pure tobacco. In Persia, hookah is called "Qalyān" (قلیان). Persian qalyan is included in the earliest European compendium on tobacco, the tobacolgia written by Johan Neander and published in Dutch in 1622. It seems that over time water pipes acquired a Persian connotation as in eighteenth-century Egypt the most fashionable pipes were called Karim Khan after the Persian ruler of the day. This is also the name used in Ukraine, Russia and Belarus. In Uzbekistan and Afghanistan, a hookah is called chillim. In Kashmir, hookah is called "Jajeer". In Maldives, hookah is called "Guduguda". In the Philippines, hookah is called "Hitboo" and normally used in smoking flavored marijuana. The hookah pipe is also known as the "Marra pipe" in the UK, especially in the North East, where it is used for recreational purposes. In Sindhi, another language of South Asia, it is called Huqqo (حُقو / हुक़्क़ो). In the Indian city of Fatehpur Sikri, Roman Catholic missionaries of the Society of Jesus arriving from the southern part of the country introduced tobacco to the Mughal emperor Akbar the Great (1542-1605 AD). Louis Rousselet writes that the physician of Akbar, Hakim Aboul Futteh Ghilani, then invented the hookah in India. However, a quatrain of Ahlī Shirazi (d. 1535), a Persian poet, refers to the use of the ḡalyān (Falsafī, II, p. 277; Semsār, 1963, p. 15), thus dating its use at least as early as the time of the Shah Ṭahmāsp I. It seems, therefore, that Abu’l-Fath Gilani should be credited with the introduction of the ḡalyān, already in use in Persia, into India. There is, however, no evidence of the existence of the water pipe until the 1560s. Moreover, tobacco is believed to have arrived in India in the 17th century, until then cannabis was smoked in India, so that suggests another substance was probably smoked in Ahlī Shirazi's quatrain, perhaps through some other method. Following the European introduction of tobacco to Persia and India, Hakim Abu’l-Fath Gilani, who came from Gilan, a province in the north of Persia, migrated to Hamarastan. He later became a physician in the Mughal court and raised health concerns after smoking tobacco became popular among Indian noblemen. He subsequently envisaged a system that allowed smoke to be passed through water in order to be 'purified'. Gilani introduced the ḡalyān after Asad Beg, the ambassador of Bijapur, encouraged Akbar I to take up smoking. Following popularity among noblemen, this new device for smoking soon became a status symbol for the Indian aristocracy and gentry. Instead of copper, brass, and low quality alloys, manufacturers increasingly use stainless steel and aluminium. Silicone rubber compounds are used for hookah hoses instead of leather and wire. New materials make modern hookahs more durable, eliminate odors while smoking and allow washing without risks of corrosion or bacterial decay. New technologies and modern design trends are changing the appearance of hookahs. Despite the obvious benefits of modern hookahs, because of high production cost and lack of modern equipment in traditional hookah manufacturing regions, most hookahs are still produced with older technologies. The intricate work on a Malabar Hookah. Gaddi village men with hookah, on mountain path near Dharamshala, India. The concept of hookah is thought to have originated in medieval India. Once the province of the wealthy, it was tremendously popular especially during Mughal rule. The hookah has since become less popular; however, it is once again garnering the attention of the masses, and cafés and restaurants that offer it as a consumable are popular. The use of hookahs from ancient times in India was not only a custom, but a matter of prestige. Rich and landed classes would smoke hookahs. Tobacco is smoked in hookahs in many villages as per traditional customs. Smoking tobacco-molasses is now becoming popular among the youth in India. There are several chain clubs, bars and coffee shops in India offering a wider variety of mu‘assels, including non-tobacco versions. Hookah was recently banned in Bangalore. However, it can be bought or rented for personal usage or organized parties. Koyilandy, a small fishing town on the west coast of India, once made and exported hookahs extensively. These are known as Malabar Hookhas or Koyilandy Hookahs. Today these intricate hookahs are difficult to find outside Koyilandy and are becoming difficult even to find in Koyilandy itself. As hookah makes resurgence in India, there have been numerous raids and bans recently on hookah smoking, especially in Gujarat. Although it has been traditionally prevalent in rural areas for generations, smoking hookahs has become very popular in the cosmopolitan cities of Pakistan. One can see many cafés in Pakistan offering hookah smoking to its guests. Even lots of households have hookahs for smoking or decoration purposes. In Punjab, Pakhtunkhwa, and in northern Balochistan, the topmost part on which coals are placed is called chillum. In big cities like Karachi and Lahore, cafes and restaurants offered Hookah and charged per hour. In 2013, it was banned by the Pakistan Supreme court. The cafe owners started offering shisha to minors, which was the major reason for the ban. The hookah has been a traditional smoking instrument in Bangladesh, particularly among the old Bengali zamindar gentry. However, flavored shisha was introduced in the early 2000s. Hookah lounges spread quite quickly between 2008–2011 and became popular among young people as well as middle-aged people as a relaxation method. There have been allegations of a government crack-down on hookah bars to prevent illicit drug usage. A hookah at a restaurant in Nepal. A man smoking Tobacco on Hookah (or Hukka) in Darchula, Nepal. Hookahs (हुक़्क़ा), especially wooden ones, are popular in Nepal. Use of hookahs has been usually considered to symbolize an elite family status in Nepali history. Nowadays, the cities of Kathmandu, Pokhara and Dharan sport special 'hookah bars'. Although hookahs have started becoming popular among younger people and tourists, the overall number of 'hookah-smokers' is likely dwindling owing to the widespread availability of cheaper cigarettes. In the Arab world and the Middle East, people smoke waterpipes as part of their culture and traditions. Local names of waterpipe in the Middle East are, argila, čelam/čelīm, ḡalyān or ghalyan, ḥoqqa, nafas, nargile, and shisha. Social smoking is done with a single or double hose hookah, and sometimes even triple or quadruple hose hookahs are used at parties or small get-togethers. When the smoker is finished, s/he either places the hose back on the table, signifying that it is available, or hands it from one user to the next, folded back on itself so that the mouthpiece is not pointing at the recipient. Most cafés in the Middle East offer shishas. Cafés are widespread and are among the chief social gathering places in the Arab world (akin to public houses in Britain). The exact date of the first use of ḡalyān in Persia is not known. However, the earliest known literary evidence of the hookah, anywhere, comes in a quatrain by Ahlī Shirazi (d. 1535), a Persian poet, referring to the use of the ḡalyān (Falsafī, II, p. 277; Semsār, 1963, p. 15), thus dating its use at least as early as the time of the Shah Ṭahmāsp I. This suggests, the hookah was already in use in ancient Persia, and it made its way into India soon afterward. Although the Safavid Shah ʿAbbās I strongly condemned tobacco use, towards the end of his reign smoking ḡalyān and čopoq (q.v.) had become common on every level of the society, women included. In schools, both teachers and students had ḡalyāns while lessons continued (Falsafī, II, pp. 278–80). Shah Safi of Persia (r. 1629-42) declared a complete ban on tobacco, but the income received from its use persuaded him to soon revoke the ban. The use of ḡalyāns became so widespread that a group of poor people became professional tinkers of crystal water pipes. During the time of Abbas II of Persia (r. 1642-1666), use of the water pipe had become a national addiction (Chardin, tr., II, p. 899). The shah (king) had his own private ḡalyān servants. Evidently the position of water pipe tender (ḡalyāndār) dates from this time. Also at this time, reservoirs were made of glass, pottery, or a type of gourd. Because of the unsatisfactory quality of indigenous glass, glass reservoirs were sometimes imported from Venice (Chardin, tr., II, p. 892). In the time of Suleiman I of Persia (r. 1694-1722), ḡalyāns became more elaborately embellished as their use increased. The wealthy owned gold and silver pipes. The masses spent more on ḡalyāns than they did on the necessities of life (Tavernier apud Semsār, 1963, p. 16). An emissary of Sultan Husayn (r.1722-32) to the court of Louis XV of France, on his way to the royal audience at Versailles, had in his retinue an officer holding his ḡalyān, which he used while his carriage was in motion (Herbette, tr. p. 7; Kasrawī, pp. 211–12; Semsār, 1963, pp. 18–19). We have no record indicating the use of ḡalyān at the court of Nader Shah, although its use seems to have continued uninterrupted. There are portraits of Karim Khan of the Zand dynasty of Iran and Fat′h-Ali Shah Qajar that depict them smoking the ḡalyān.Iranians have a special tobacco called Khansar (خانسار, presumably name of the origin city, Khvansar). The charcoals would be put on the Khansar without foil. Saudi Arabia is in the process of implementing general smoking bans in public places. This includes shishas. Additionally, the city of Riyadh has banned shisha cafes within city limits. Bedouin smoking a hookah, locally called nargileh, in a coffeehouse in Deir ez-Zor, on the Euphrates, 1920s. Although perceived to be an important cultural feature of Syria (see Smoking in Syria), narghile had declined in popularity during most of the twentieth century and was used mostly by older men. Similar to other Middle Eastern countries, its use increased dramatically during the 1990s, particularly among youth and young adults. As of 2004, prior to the Syrian Civil War, 17% of 18- to 29-year-olds, 10% of 30- to 45-year-olds, and 6% of 46- to 65-year-olds reported using narghile, and use was higher in men than women. More recent data is not available. Nargile became part of Turkish culture from the 17th century. Back then, it became prominent in society and was used as a status symbol. Nargile was such an important Turkish custom that it even sparked a diplomatic crisis between France and the Ottoman Empire. Western Turkey is noted for its traditional pottery production where potters make earthenware objects, including nargile bowls. In Southeast Asia, the hookah, where it is predominantly called shisha, was particularly used within the Arab and Indian communities. Hookah was virtually unknown in Southeast Asia before the latter 20th century, yet the popularity among contemporary younger people is now vastly growing. Southeast Asia's most cosmopolitan cities, Makati, Bangkok, Singapore (now banned), Phnom Penh, Siem Reap, Hanoi and Ho Chi Minh City, now have various bars and clubs that offer hookahs to patrons. Although hookah use has been common for hundreds of years and enjoyed by people of all ages, it has recently started to become a youth peoples' pastime in Asia. Hookahs are most popular with college students, and young adults, who may be underage and thus unable to purchase cigarettes. In South Africa, hookah, colloquially known as a hubbly bubbly or an okka pipe, is popular among the Cape Malay and Indian populations, wherein it is smoked as a social pastime. [not in citation given] However, hookah is seeing increasing popularity with South Africans, especially the youth. Bars that additionally provide hookahs are becoming more prominent, although smoking is normally done at home or in public spaces such as beaches and picnic sites. In South Africa, the terminology of the various hookah components also differ from other countries. The clay "head/bowl" is known as a "clay pot". The hoses are called "pipes" and the air release valve is known as a "clutch". The windscreen (which is considered optional and not used by most people) is known as an "As-jas", which directly translates from Afrikaans to English as an "ash-jacket". Also, making/preparing the "clay pot" is commonly referred to as "racking the hubbly". Some scientists point to the marijuana pipe as an African origin of hookah. During the 1960s and 1970s, hookahs were a popular tool for the consumption of various derivations of tobacco, among other things. At parties or small gatherings the hookah hose was passed around with users partaking as they saw fit. Typically, though, open flames were used instead of burning coals. Today, hookahs are readily available for sale at smoke shops and some gas stations across the United States, along with a variety of tobacco brands and accessories. In addition to private hookah smoking, hookah lounges or bars have opened in cities across the country. Recently, certain cities, counties, and states have implemented indoor smoking bans. In some jurisdictions, hookah businesses can be exempted from the policies through special permits. Some permits, however, have requirements such as the business earning a certain minimum percentage of their revenue from alcohol or tobacco. In cities with indoor smoking bans, hookah bars have been forced to close or switch to tobacco-free mixtures. In many cities though, hookah lounges have been growing in popularity. From the year 2000 to 2004, over 200 new hookah cafés opened for business, most of them targeted at young adults and located near college campuses or cities with large Middle-Eastern communities. This activity continues to gain popularity within the post-secondary student demographic. Hookah use among high school students rose from 4.1% to 9.4% from 2011 to 2014 while cigarette smoking decreased from 15.8% to 9.2% during this same time period, according to the US CDC. According to a 2011 study, 40.3 percent of college and university students surveyed had smoked tobacco from a hookah. As of 8 July 2013, at least 1,178 college or university campuses in the U.S. have adopted 100% smokefree campus policies that attempt to eliminate smoking in indoor and outdoor areas across the entire campus, including residences. Excluding grommets, a hookah consists of a number of components, four of which are essential for its operation. Also known as the head of the hookah, the bowl is a container, usually made out of clay, marble, or glass that holds the coal and tobacco during the smoking session. The bowl is loaded with tobacco then covered by a screen or perforated aluminum foil. Lit coals are then placed on top, which allows the tobacco to heat to the proper temperature. There is also a variation of the head that employs a fruit[clarification needed] rather than the traditional clay bowl. The fruit is hollowed out and perforated in order to achieve the same shape and system a clay bowl has, then it is loaded and used in the same manner. Bowls have evolved in recent years to incorporate new designs that keep juices in the tobacco from running down the stem. The Tangiers Phunnel Bowl and Sahara Smoke Vortex Bowl are two examples of such bowls. A Hookah Cover windscreen is a cover that sits over the bowl area, with some form of air holes. This prevents wind from increasing the burn rate and temperature of the coal, and prevents ash and burning embers from being blown onto the surrounding environment. This may also offer some limited protection from fire as it may prevent the coal from being ejected if the hookah is bumped. The hose (one or more) is a slender flexible tube that allows the smoke to be drawn for a distance, cooling down before inhalation. The end is typically fitted with a metal, wooden, or plastic mouthpiece of different shapes, size, color or material type. Today, the hose proper is typically made from vinyl which allows it to be easily cleaned. According to J. S. Gamble in A Manual of Indian Timbers in 1902 (p. 668), the bark of the white Himalayan birch Betula utilis ssp. jacquemontii was used to make early hookah tubes. Many hookahs are equipped with a purge valve connected to the airspace in the water jar to purge stale smoke that has been sitting unused in the jar for too long. This one-way valve is typically a simple ball bearing sitting over a port that seals the port by gravity alone and will open if positive pressure is created by blowing into the hose. The bearing is held captive with a screw-on cover. The cover should be opened and the bearing and seat cleaned of residue and corrosion regularly to ensure proper sealing. The body of the hookah sits on top of the water base, or sometimes referred to as vase. The downstem hangs down below the level of the water in the jar. Smoke passes through the body and out the downstem where it bubbles through the water. This cools and humidifies the smoke. Liquids such as fruit juice may be added to the water or used in substitution. Pieces of fruit, mint leaves, and crushed ice may be added. A plate or ashtray sits just below the bowl to catch ashes falling off the coals. Grommets in a hookah are usually placed between the bowl and the body, between the body's gasket and the water jar, and between the body and the hose. The grommets, although not essential (the use of paper or tape has become common), will help to seal the joints between the parts, therefore decreasing the amount of air coming in and maximizing the smoke breathed in. A piece attached to the bottom of the stem, usually made of plastic and in a grid pattern, to make a smoother smoke and a subdued noise. By breaking the naturally larger bubbles coming up the water from the pipe into smaller bubbles, it lowers the amount of suction or "pull" needed to continue bringing smoke to the chamber. This also cools the smoke down more efficiently. It is used as a luxury item used for a better smoking experience and is not a required component. Tobacco or Mu‘assel (Arabic: معسل, which means "honeyed"), also sometimes called Shisha in places where it does not refer to the Hookah itself, is a syrupy tobacco mix with molasses and vegetable glycerol as moisturizer and specific flavors added to it. Typical flavors of mu‘assel include apple, grape, guava, lemon, mint, as well as many other fruit based mixes. Non-tobacco-based mu'assel is also available in certain areas where tobacco smoking is not allowed. Charcoal is the source of energy to produce heat that will be transferred to the tobacco inside the bowl. Since the glycerol is used to moisturize the tobacco, then to produce smoke, the charcoal should be able to generate heat above the boiling point of glycerol that is 290 °C. Therefore, charcoal for hookah smoking must be hard, high density, easy to ignite, and burn longer with persistent heat. The jar at the bottom of the hookah is filled with water sufficient to submerge a few centimeters of the body tube, which is sealed tightly to it. Deeper water will only increase the inhalation force needed to use it. Tobacco or tobacco-free molasses are placed inside the bowl at the top of the hookah. Often the bowl is covered with perforated tin foil or a metal screen and coal placed on top. The foil or screen separates the coal and the tobacco, which reduces inhalation of coal ash from the smoke and reduces the temperature the tobacco is exposed to, in order to prevent burning the tobacco directly. When one inhales through the hose, air is pulled through the charcoal and into the bowl holding the tobacco. The hot air, heated by the charcoal vaporizes the tobacco without burning it. [verification needed] The vapor is passed down through the body tube that extends into the water in the jar. It bubbles up through the water, losing heat, and fills the top part of the jar, to which the hose is attached. When a smoker inhales from the hose, smoke passes into the lungs, and the change in pressure in the jar pulls more air through the charcoal, continuing the process. If the hookah has been lit and smoked but has not been inhaled for an extended period, the smoke inside the water jar may be regarded as "stale" and undesirable. Stale smoke may be exhausted through the purge valve, if present. This one-way valve is opened by the positive pressure created from gently blowing into the hose. It will not function on a multiple-hose hookah unless all other hoses are plugged. Sometimes one-way valves are put in the hose sockets to avoid the need to manually plug hoses. When people share a hookah, there is a risk of spreading infections diseases such as oral herpes, tuberculosis, hepatitis, influenza, and H. pylori. Using personal disposable mouthpieces may reduce this risk but does not eliminate it. Hookah smoke contains multiple toxic chemicals. Water does not filter out many of these chemicals. Hookah smoke contains toxic chemicals that come from the burning of the charcoal, tobacco, and flavorings. Hookah smokers inhale many chemicals that can cause cancer, heart disease, lung disease, and other health problems. These chemicals include tobacco-specific nitrosamines, polycyclic aromatic hydrocarbons (PAHs; e.g., benzo[a]pyrene and anthracene), volatile aldehydes (e.g. formaldehyde, acetaldehyde, acrolein), benzene, nitric oxide, heavy metals (arsenic, chromium, lead), and carbon monoxide (CO). Hookah smoking increases the amount of carbon monoxide (CO) in a person's body to eight times their normal level. Compared to smoking one cigarette, a single hookah session exposes users to more carbon monoxide and PAHs, similar levels of nicotine, and lower levels of tobacco-specific nitrosamines. Because of inhaling these chemicals, hookah smokers are at increased risk of many of the same health problems as cigarette smokers. Carbon monoxide (CO) in hookah smoke binds to hemoglobin in the blood to form carboxyhemoglobin, which reduces the amount of oxygen that can be transported to organs including the brain. There are several case reports in the medical literature of hookah smokers needing treatment in hospital emergency rooms for symptoms of CO poisoning including headache, nausea, lethargy, and fainting. This is sometimes called “hookah sickness.” Hookah smoking can damage the cardiovascular system in several ways. Its use elevates heart rate and blood pressure. It also impairs baroreflex control (which helps to control blood pressure) and cardiac autonomic functioning (which has many purposes, including control of heart rate) Hookah use also acutely harms vascular functioning, increases inflammation, and harms lung function and reduces the ability to exercise. Current evidence indicates hookah may cause numerous health problems. Hookah smoking appears to increase the risk of several cancers (lung, esophageal, and gastric), pulmonary diseases (impaired pulmonary function, chronic bronchitis, and emphysema), coronary artery disease, periodontal disease, obstetrical and perinatal problems (low birth weight and pulmonary problems at birth), larynx and voice changes, and osteoporosis. Many of the studies to date have methodological limitations, such as not measuring hookah use in a standardized way. Larger, high quality studies are needed to learn more about the long-term health effects of hookah use and of exposure to hookah smoke. Second-hand smoke from hookahs contains significant amounts of carbon monoxide, aldehydes, PAHs, ultrafine particles, and respirable particulate matter (particles small enough to enter the lungs). Study have found that concentrations of particulate matter in the air of hookah bars were in the unhealthy to hazardous range according to Environmental Protection Agency standards. The air in hookah bars also contains significant amounts of toxic chemicals including: aromatic hydrocarbons, carbon monoxide, nicotine, and trace metals. The concentrations in the air of all these toxic substances are greater than for cigarettes (for the same number of smokers per hour). During a typical one-hour hookah session, a user expels into the air 2-10 times the amount of cancer-causing chemicals and other harmful chemicals compared to a cigarette smoker. No studies have examined the long-term health effects of exposure to secondhand hookah smoke, but short term effects may include experience respiratory symptoms such as wheezing, nasal congestion, and chronic cough. Hookah bar employees, who often are exposed to toxic air for extended amounts of time, may be at especially high risk of health problems from secondhand smoke. Hookah smokers inhale nicotine, which is an addictive chemical. A typical hookah smoking session delivers 1.7 times the nicotine dose of one cigarette and the nicotine absorption rate in daily waterpipe users is equivalent to smoking 10 cigarettes per day. Many hookah smokers, especially frequent users, have urges to smoke and show other withdrawal symptoms after not smoking for some time, and it can be difficult to quit. These signs and symptoms of addiction and dependence are very similar to the signs of cigarette addiction. People who become addicted to hookah may be more likely to smoke alone. Hookah smokers who are addicted may find it easier to quit if they have help from a quit-smoking counseling program. ^ a b c The Ceylon Antiquary and Literary Register, Volume 1. The Times. 1916. p. 111. It has even drawn largely on English, and such words as daktar and platfarm, isteshan and tikat, trem-ghari and rel-ghari, registran karna and apil karna are as common as similar words are in Ceylon. To make up for it Hindustani has not only enriched the vocabulary of Anglo-Indian English with such words as topi and pugre, oheerot and hookah, dhoby and sepoy, ghary and tamasha, durbar and bukshish, Kachcheri and Punkah, but has contributed to it words like jungle, bazar, [and] loot. ^ a b Pathak, R. S. (1994). Indianisation of English Language and Literature. Bahri Publications. p. 72. Bhabani Bhattacharya, who uses Hindi words like taveez, laddoo, hookah, vaid and halwai, also makes deft employment of reverential term Bai for the heroine besides using exclamatory terms as ‘Ho’, ‘Han’ (yes) and ‘Ram-Ram’. ^ a b Devichand, Mukul (2007-06-25). "UK | Magazine | Pipe dream". BBC News. Retrieved 2013-09-03. Despite being a recent addition to British culture, shisha has a long history. Many believe that it originated in India (known there as "hookah") about a thousand years ago, when more often the shisha pipe was used to smoke opium rather than tobacco. ^ The cyclopaedia of India and of Jordan and eastern and southern Asia, Volume 2. Bernard Quaritch. 1885. Retrieved 2007-08-01. HOOKAH. Hindi. The Indian pipe and apparatus for smoking. ^ "Hookah". Encyclopædia Britannica. Retrieved 2008-04-08. ^ "WHO Study Group on Tobacco Product Regulation (TobReg) an advisory note Waterpipe tobacco smoking: dangerous health effects include risk to public safety if used by multiple users, research needs and recommended actions by regulators, 2005" (PDF). World Health Organization. Retrieved 2013-09-03. ^ a b c d e f WHO Study Group on Tobacco Product Regulation (2015). Advisory note: waterpipe tobacco smoking: health effects, research needs and recommended actions by regulator (PDF) (2nd. ed.). Geneva: World Health Organization. ^ Akl, EA; Gaddam, S; Gunukula, SK; Honeine, R; Jaoude, PA; Irani, J (June 2010). "The effects of waterpipe tobacco smoking on health outcomes: a systematic review". International Journal of Epidemiology. 39 (3): 834–57. doi:10.1093/ije/dyq002. PMID 20207606. ^ a b c d e f El-Zaatari, ZM; Chami, HA; Zaatari, GS (March 2015). "Health effects associated with waterpipe smoking". Tobacco Control. 24 Suppl 1: i31–i43. doi:10.1136/tobaccocontrol-2014-051908. PMC 4345795. PMID 25661414. ^ Forrest, Sir George (1903). Cities of India. A. Constable and Company, Limited. p. 206. It was here he used to receive the strangers who used to flock to his court from all parts of the earth. Here he received the Jesuits of Goa who brought him the leaves and seeds of tobacco, and it was at Fattehpur-Sikri the hookah is supposed to have been invented. ^ Singleton, Esther (1901). Romantic Castles and Places. Dodd, Mead & Co. p. 114. According to tradition, it was here that he received the Jesuits of Goa, who brought him the leaves and seeds of tobacco; and it was at Futtehpore that Hakim Aboul Futteh Ghilani, one of Akbar's physicians, is supposed to have invented the hookah, the pipe of India. ^ a b c d Rousselet, Louis (1875). India and Its Native Princes: Travels in Central India and in the Presidencies of Bombay and Bengal. London: Chapman & Hall. p. 290. According to tradition, it was here that he received the Jesuits of Goa, who brought him the leaves and seeds of tobacco; and it was at Futtehpore that Hakim Aboul Futteh Ghilani, one of Akbar's physicians, is supposed to have invented the hookah, the pipe of India. ^ Curtis, William Eleroy (1909). Modern India. Revell. p. 246. The hookah, the big tobacco pipe, with a long tube and a bowl of perfumed water for the smoke to pass through, is said to have been invented at Fattehpur Sikri by one of Akbar's engineers. ^ a b Blechynden, Kathleen (1905). Calcutta, Past and Present. Los Angeles: University of California. p. 215. It is said that it was in the early years of their settlement at Hughly that the Portuguese introduced tobacco to the notice of the Emperor Akbar, and that the Indian pipe, the hookah, was invented. ^ a b c d e Sivaramakrishnan, V. M (2001). Tobacco and Areca Nut. Hyderabad: Orient Blackswan. pp. 4–5. ISBN 978-81-250-2013-4. The hookah is of historical interest. Portuguese merchants introduced toabcco leaves and European style pipes into Bijapur, the glittering capital of the Adil Shahi kingdom. From here, Asad Beg, the Moghul ambassador in Bijapur, took a large quantity of tobacco leaves and pipes to the Mughal court. He presented Emperor Akbar with some tobacco leaves and a jewel encrusted European style pope. Out of courtesy and curiosity, Akbar took a few puffs, but his personal physician was worried that tobacco smoke, a hitherto totally unknown substance, might be dangerous. So, he suggested that the smoke be purified by passing it through water, before being inhaled. Thus, the hookah, or water pipe, came into being. ^ a b Khaled Aljarrah; Zaid Q Ababneh; Wael K Al-Delaimy (2009). "Perceptions of hookah smoking harmfulness: predictors and characteristics among current hookah users". Tobacco Induced Diseases. 5 (1): 16. doi:10.1186/1617-9625-5-16. ISSN 1617-9625. PMC 2806861. PMID 20021672. Hookahs originated in India in the 15th century and then spread to the Near East countries. Hookahs spread first to Persia and underwent further changes to its original shape to the current known shape. In the middle of the 16th century, hookahs reached the Ottoman Empire, Egypt, and other Mediterranean regions. ^ Nichola Fletcher (1 Aug 2005). Charlemagne's tablecloth: a piquant history of feasting. Macmillan. p. 10. ISBN 9780312340681. ^ Robert Machray (1902). "The Pipes of All Peoples". Cassell's Magazine: 210–215. ^ Harmsworth Brothers (1899). "The Harmsworth monthly pictorial magazine". Harmsworth Brothers: 372. ^ Sandra Alters; Wendy Schiff (28 Jan 2011). Essential Concepts for Healthy Living Update. Jones & Bartlett Learning. ISBN 9780763789756. ^ Prakash C. Gupta (1992). Control of tobacco-related cancers and other diseases: proceedings of an international symposium, January 15–19, 1990, TIFR, Bombay. Prakash C. Gupta. p. 33. ISBN 9780195629613. ^ Qadeer, Atlaf (2011). "The Socio-Cognitive Dynamics of Hindi/Urdu Lexemes in the Concise Oxford English Dictionary" (PDF). Retrieved 8 October 2016. ^ Pathak, R. S. (1994). Indianisation of English Language and Literature. Bahri Publications. p. 24. In the domain of philosophy, religion and fine arts, particularly music, the words come entirely from Hindi-Sanskrit. The commonest ones are puja, bhajan, shastra, purana, karma, vina, raga, etc. Finally, common festivals and socio-cultural institutions throughout the country provide such terms as Holi, Dee(pa)wali, brahmin, sudra, hookah, bidi, budmash, shikari and so on. ^ Brockman, LN; Pumper, MA; Christakis, DA; Moreno, MA (December 2012). "Hookah's new popularity among US college students: a pilot study of the characteristics of hookah smokers and their Facebook displays". BMJ Open. 2. 2 (6): e001709. doi:10.1136/bmjopen-2012-001709. PMC 3533013. PMID 23242241. ^ Dora-Laskey, Prathim-Maya. Postmodern Chic and Postcolonial Cheek: A Map of Linguistic Resistance, Hybridity, and Pedagogy in Rushdie's Midnight's Children. York University. pp. 190–193. ^ Cook, Vivian (9 December 2010). It's All in a Word: History, meaning and the Sheer Joy of Words. Profile Books. p. 72. ISBN 9781847653192. Ever since the British went to India, many words from Indian languages have travelled in the reverse direction. The changing historical relationship between the two countries is shown in the different kinds of words that the English language borrowed at different periods, according to the Indian expert Subba Roa. In the seventeenth century it was trade that counted. The names of Indian places were used for particular materials, such as calico (a city) or cashere" (Kashmir). In the eighteenth century, though trade continued to bring in wordss such as jute and seersucker, influences came from Indian culture, such as hookah (alias hubble-bubble, a kind of smoking device), and the military, as in sepoy (native Indian soldier). ^ Memoirs of William Hickey (Volume II ed.). London: Hurst & Blackett. 1918. p. 136. ^ "Nargile". mymerhaba. Retrieved 2013-09-03. ^ "Smoke like an Egyptian—Sri Lanka". Lankanewspapers.com. Retrieved 2010-08-22. ^ "Nargile on the map". ezglot. Retrieved 2017-04-29. ^ "Diccionario de la lengua española - Vigésima segunda edición" (in Spanish). Buscon.rae.es. Retrieved 2010-08-22. ^ "تعريف و معنى شيشة في معجم المعاني الجامع". المعاني - معجم عربي عربي. Almaany. Retrieved 29 April 2018. ^ Rudolph P. Matthee (2005). The pursuit of pleasure: drugs and stimulants in Persian history, 1500-1900. Princeton University Press. p. 124. ISBN 978-0691118550. ^ Robert Connell Clarke (1998). Hashish!. Red Eye Press. p. 140. ISBN 9780929349053. ^ Melvin Ember, Carol R. Ember (2001). Countries and Their Cultures: Laos to Rwanda. Macmillan Reference USA. p. 1377. ISBN 9780028649498. ^ "Shisha King". Shisha King (in German). Retrieved 2018-06-08. ^ "Shisha". Babylon FC. Retrieved 29 April 2018. ^ "Online Etymology Dictionary". Dictionary.com. Retrieved 30 June 2011. ^ Rousselet, Louis (2005) . "XXVII — The Ruins of Futtehpore". India and Its Native Princes: Travels in Central India and in the Presidencies of Bombay and Bengal (Reprint — Asian Educational Services 2005 ed.). London: Chapman and Hall. p. 290. ISBN 978-81-206-1887-9. According to tradition, it was here that he received the Jesuits of Goa, who brought him the leaves and seeds of tobacco and it was a Futtehpore that Hakim Aboul Futteh Ghilani, one of Akbar's physicians, is supposed to have invented the hookah, the pipe of India. ^ a b Razpush, Shahnaz (15 December 2000). "ḠALYĀN". Encyclopedia Iranica. pp. 261–65. Retrieved 19 December 2012. ^ "Tobacco". Encyclopaedia Iranica. Iranica online. 2009-07-20. Retrieved 2013-09-03. ^ "History of Shisha". ShishAware. Archived from the original on 12 May 2012. Retrieved 21 June 2013. ^ "An Oriental Delight". What I learned today. Medium. Archived from the original on 16 January 2014. Retrieved 21 June 2013. ^ "Everything You Wanted to Know About Shisha Pipes". The Shisha Shop. Retrieved 9 June 2015. ^ "Business at hookah-less cafes go up in smoke". The Times Of India. 7 June 2011. ^ "Hookah". Indian Express. Retrieved 2008-06-08. ^ Sajid, Khan; Chaouachi, Kamal; Mahmood, Rubaida (2008). "Full text | Hookah smoking and cancer: carcinoembryonic antigen (CEA) levels in exclusive/ever hookah smokers". Harm Reduction Journal. 5: 19. doi:10.1186/1477-7517-5-19. PMC 2438352. PMID 18501010. ^ "Sheesha ban smoked". The Pakistan Today. 8 July 2013. Retrieved 7 March 2015. ^ Kaneta Choudhury; S.M.A. Hanifi; Abbas Bhuiya; Shehrin Shaila Mahmood (December 2007). "Sociodemographic Characteristics of Tobacco Consumers in a Rural Area of Bangladesh". Journal of Health, Population and Nutrition. 25 (4): 456–464. PMC 2754020. PMID 18402189. ^ Ahmed Shatil Alam. "Killer in disguise". The New Age. Retrieved 7 March 2015. ^ Dikshit, K. R.; Dikshit, Jutta K. (2013-10-21). North-East India: Land, People and Economy. Springer Science & Business Media. ISBN 9789400770553. ^ Nepal, ECS. "Smoke on The Water: Hubby-bubbly .Hookah". ECS Nepal. Archived from the original on 24 July 2011. Retrieved 28 February 2011. ^ Shane Christensen (25 Jan 2011). Frommer's Dubai. John Wiley & Sons. p. 141. ISBN 9781119994275. ^ Fritz Allhoff (23 Feb 2011). Coffee - Philosophy for Everyone: Grounds for Debate. John Wiley & Sons. p. 10. ISBN 9781444393361. ^ Rudolph P. Matthee (2005). The pursuit of pleasure: drugs and stimulants in Iranian history, 1500-1900. Princeton University Press. p. 139. ISBN 978-0691118550. ^ "Encyclopædia Iranica | Articles". Iranica.com. Retrieved 2010-08-22. ^ "Iranian Pure Tobacco". Iranian Tobacco Company. Iranian Tobacco Company. Retrieved 29 April 2018. ^ "Saudi Arabia bans smoking in public places". The National (Abu Dhabi). 31 July 2012. Retrieved 31 October 2014. ^ "Saudi Arabia Bans Smoking In Most Public Places". The Huffington Post. Retrieved 31 October 2014. ^ Rastram, S; Ward, KD; Eissenberg, T; Maziak, W (2004). "Estimating the beginning of the waterpipe epidemic in Syria". BMC Public Health. 4 (32): 32. doi:10.1186/1471-2458-4-32. PMC 514554. PMID 15294023. ^ a b Ward, KD; Hammal, F; Vander Weg, MW; Maziak, W; Eissenberg, T (2006). "The tobacco epidemic in Syria". Tobacco Control. 15 (Supplement 1): i24–9. doi:10.1136/tc.2005.014860. PMC 2563543. PMID 16723671. ^ Kinzer, Stephen (1997-06-10). "Inhale the Pleasure of an Unhurried Ottoman Past". The New York Times. Retrieved 2013-09-03. ^ Crane, Howard (1988). "Traditional Pottery Making in the Sardis Region of Western Turkey". Muqarnas. 5: 12. ^ "Use of Cigarettes and Other Tobacco Products Among Students Aged 13-15 Years - Worldwide, 1999-2005". CDC. Retrieved 2010-08-22. ^ "Hubble-bubble as cafes go up in smoke". Independent Online. 14 October 2002. Archived from the original on 23 October 2012. Retrieved 2010-08-22. ^ van der Merwe, N.; et al. (2013). "Hookah pipe smoking among health sciences students". The South African Medical Journal. 103 (11): 847–849. doi:10.7196/SAMJ.7448. PMID 24148170. ^ Jillian Krotki (29 October 2008). "Hookah lounge brings '60s pastime back to the present". Seminole Chronicle. Archived from the original on 19 September 2012. Retrieved 3 September 2013. ^ Harben, Victoria (2 May 2006). "Beyond the Smoke, There is a Solidarity Among Cultures". Cgnews.org. Archived from the original on 17 October 2013. Retrieved 2013-09-03. ^ Quenqua, Douglas (30 May 2011). "Putting a Crimp in the Hookah". The New York Times. Retrieved 2013-09-03. ^ Arrazola, RA; et al. (17 April 2015). "Tobacco use among middle and high school students--United States, 2011-2014". Mortality and Morbidity Weekly Report. 64 (14): 381–385. ^ "Hookah Use Widespread Among College Students; Study Reveals Mistaken Perception of Safety in Potential Gateway Drug". Science Daily. 6 April 2011. Retrieved 2013-09-03. ^ "Colleges and Universities". no-smoke.org. ^ "Hookah Charcoal Characteristics". Supreme Carbon Indonesia. Retrieved 2013-09-03. ^ Mridula, Morgan (2009). Hamid-Balma, Sarah, ed. "Vaporizers: Safe Alternatives to Smoking?" (PDF). Visions Journal: British Columbia's Mental Health and Addictions Journal. 5 (4): 29. ISSN 1490-2494. ^ "Hookah Smoking — A Growing Threat to Public Health" (PDF). American Lung Association. Retrieved 27 June 2018. ^ "Waterpipe and Hookah Smoking - A Dangerous New Trend". Simcoe Muskoka District Health Unit. 30 October 2015. ^ a b c d Akl, EA; Gaddam, S; Gunukula, SK; Honeine, R; Jaoude, PA; Irani, J (2010). "The effects of waterpipe tobacco smoking on health outcomes: a systematic review". International Journal of Epidemiology. 39 (3): 834–57. doi:10.1093/ije/dyq002. PMID 20207606. ^ a b c Shihadeh, A; Schubert, J; Klaiany, J; El Sabban, M; Luch, A; Saliba, NA (2015). "Toxicant content, physical properties and biological activity of waterpipe tobacco smoke and its tobacco-free alternatives". Tobacco Control. 24 (Supplement 1): i22–i30. doi:10.1136/tobaccocontrol-2014-051907. PMC 4345918. PMID 25666550. ^ Martinasek, MP; Ward, KD; Calvanese, AV (2014). "Change in carbon monoxide exposure among waterpipe bar patrons". Nicotine & Tobacco Research. 16 (7): 1014–9. doi:10.1093/ntr/ntu041. PMID 24642592. ^ Cavus, UY; Rehber, ZH; Ozeke, O; Ilkay, E (2010). "Carbon monoxide poisoning associated with narghile use". Emergency Medicine Journal. 27 (5): 406. doi:10.1136/emj.2009.077214. PMID 20442182. ^ La Fauci, G; Weiser, G; Steiner, IP; Shavit, I (2012). "Carbon monoxide poisoning in narghile (water pipe) tobacco smokers". Canadian Journal of Emergency Medicine. 14 (1): 57–59. PMID 22417961. ^ Lim, BL; Lim, GH; Seow, E (2009). "Case of carbon monoxide poisoning after smoking shisha". International Journal of Emergency Medicine. 2 (2): 121–122. doi:10.1007/s12245-009-0097-8. PMC 2700232. PMID 20157455. ^ Türkmen, S; Eryigit, U; Sahin, A; Yeniocak, S; Turedi, S (2011). "Carbon monoxide poisoning associated with water pipe smoking". Clinical Toxicology. 49 (7): 697–698. doi:10.3109/15563650.2011.598160. PMID 21819288. ^ Pearl, Mike. "Is hookah sickness just carbon monoxide poisoning". Archived from the original on 15 June 2015. Retrieved 13 June 2015. ^ a b Alomari, MA; Khabour, OF; Alzoubi, KH; Shqair, DM; Eissenberg, T (2014). "Central and peripheral cardiovascular changes immediately after waterpipe smoking". Inhal Toxicol. 26 (10): 579–587. doi:10.3109/08958378.2014.936572. PMID 25144473. ^ Al-Kubati, M; Al-Kubati, AS; al'Absi, M; Fiser, B. (2006). "The short-term effect of water-pipe smoking on the baroreflex control of heart rate in normotensives". Autonomic Neuroscience. 126–127: 146–9. doi:10.1016/j.autneu.2006.03.007. PMID 16716761. ^ Cobb, CO; Sahmarani, K; Eissenberg, T; Shihadeh, A (2012). "Acute toxicant exposure and cardiac autonomic dysfunction from smoking a single narghile waterpipe with tobacco and with a "healthy" tobacco-free alternative". Toxicology Letters. 215 (1): 70–75. doi:10.1016/j.toxlet.2012.09.026. PMC 3641895. PMID 23059956. ^ St Helen, G; Benowitz, NL; Dains, KM; Havel, C; Peng, M; Jacob, P (2014). "Nicotine and carcinogen exposure after water pipe smoking in hookah bars". Cancer Epidemiol Biomarkers Prev. 23 (6): 1055–66. doi:10.1158/1055-9965.EPI-13-0939. PMC 4047652. PMID 24836469. ^ Hakim, F; Hellou, E; Goldbart, A; Katz, R; Bentur, Y; Bentur, L (April 2011). "The acute effects of water-pipe smoking on the cardiorespiratory system". Chest. 139 (4): 775–81. doi:10.1378/chest.10-1833. PMID 21030492. ^ Hawari, FI; Obeidat, NA; Ayub, H; Ghonimat, I; Eissenberg, T; Dawahrah, S; Beano, H (August 2013). "The acute effects of waterpipe smoking on lung function and exercise capacity in a pilot study of healthy participants". Inhalation Toxicology. 25 (9): 492–7. doi:10.3109/08958378.2013.806613. PMID 23905967. ^ Kumar, SR; Davies, S; Weitzman, M; Sherman, S (March 2015). "A review of air quality, biological indicators and health effects of second-hand waterpipe smoke exposure". Tobacco Control. 24 Suppl 1: i54–i59. doi:10.1136/tobaccocontrol-2014-052038. PMC 4345792. PMID 25480544. ^ a b Daher, N; Saleh, R; Jaroudi, E; Sheheitli, H; Badr, T; Sepetdjian, E; Al Rashidi, M; Saliba, N; Shihadeh, A (1 January 2010). "Comparison of carcinogen, carbon monoxide, and ultrafine particle emissions from narghile waterpipe and cigarette smoking: Sidestream smoke measurements and assessment of second-hand smoke emission factors". Atmospheric Environment. 44 (1): 8–14. doi:10.1016/j.atmosenv.2009.10.004. PMC 2801144. PMID 20161525. ^ Tamim, H; Musharrafieh, U; El Roueiheb, Z; Yunis, K; Almawi, WY (2003). "Exposure of children to environmental tobacco smoke (ETS) and its association with respiratory ailments". The Journal of Asthma. 40 (5): 571–6. doi:10.1081/jas-120019029. PMID 14529107. ^ Zeidan, RK; Rachidi, S; Awada, S; El Hajje, A; El Bawab, W; Salamé, J; Bejjany, R; Salameh, P (August 2014). "Carbon monoxide and respiratory symptoms in young adult passive smokers: a pilot study comparing waterpipe to cigarette". International Journal of Occupational Medicine and Environmental Health. 27 (4): 571–82. doi:10.2478/s13382-014-0246-z. PMID 25012596. ^ Eissenberg, T; Shihadeh, A (December 2009). "Waterpipe tobacco and cigarette smoking: direct comparison of toxicant exposure". American Journal of Preventive Medicine. 37 (6): 518–23. doi:10.1016/j.amepre.2009.07.014. PMC 2805076. PMID 19944918. ^ Neergaard, J; Singh, P; Job, J; Montgomery, S (October 2007). "Waterpipe smoking and nicotine exposure: a review of the current evidence". Nicotine & Tobacco Research. 9 (10): 987–94. doi:10.1080/14622200701591591. PMC 3276363. PMID 17943617. ^ Aboaziza, E; Eissenberg, T (March 2015). "Waterpipe tobacco smoking: what is the evidence that it supports nicotine/tobacco dependence?". Tobacco Control. 24 Suppl 1: i44–i53. doi:10.1136/tobaccocontrol-2014-051910. PMC 4345797. PMID 25492935. ^ a b Asfar, T; Al Ali, R; Rastam, S; Maziak, W; Ward, KD (June 2014). "Behavioral cessation treatment of waterpipe smoking: The first pilot randomized controlled trial". Addictive Behaviors. 39 (6): 1066–74. doi:10.1016/j.addbeh.2014.02.012. PMC 4141480. PMID 24629480. ^ Rastam, S; Eissenberg, T; Ibrahim, I; Ward, KD; Khalil, R; Maziak, W (May 2011). "Comparative analysis of waterpipe and cigarette suppression of abstinence and craving symptoms". Addictive Behaviors. 36 (5): 555–9. doi:10.1016/j.addbeh.2011.01.021. PMC 3061840. PMID 21316156. ^ Ward, KD; Hammal, F; VanderWeg, MW; Eissenberg, T; Asfar, T; Rastam, S; Maziak, W (February 2005). "Are waterpipe users interested in quitting?". Nicotine & Tobacco Research. 7 (1): 149–56. CiteSeerX 10.1.1.625.4651. doi:10.1080/14622200412331328402. PMID 15804687. ^ Maziak, W; Eissenberg, T; Ward, KD (January 2005). "Patterns of waterpipe use and dependence: implications for intervention development". Pharmacology Biochemistry and Behavior. 80 (1): 173–9. doi:10.1016/j.pbb.2004.10.026. PMID 15652393. ^ Dogar, O; Jawad, M; Shah, SK; Newell, JN; Kanaan, M; Khan, MA; Siddiqi, K (June 2014). "Effect of cessation interventions on hookah smoking: post-hoc analysis of a cluster-randomized controlled trial". Nicotine & Tobacco Research. 16 (6): 682–8. doi:10.1093/ntr/ntt211. PMID 24376277. ^ Maziak, Wasim; Jawad, Mohammed; Jawad, Sena; Ward, Kenneth D.; Eissenberg, Thomas; Asfar, Taghrid (2015-07-31). "Interventions for waterpipe smoking cessation". The Cochrane Database of Systematic Reviews (7): CD005549. doi:10.1002/14651858.CD005549.pub3. ISSN 1469-493X. PMC 4838024. PMID 26228266. Wikimedia Commons has media related to Hookahs. Wikisource has the text of the 1911 Encyclopædia Britannica article Hookah.